With the CLA Game Fair at Blenheim Palace starting on 18th July we are busy preparing for our stand (B184) where we will have 3 of our Truxor amphibious machines on display for visitors to get a good look at. 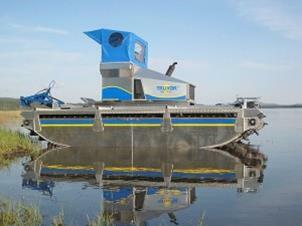 These amazing machines are the ideal tool to use for the management of any large ponds, lakes or waterways. Driven by one of our skilled and experienced team these amazing vehicles will tackle silt pumping and dredging, aquatic weed cutting, excavating, raking and clearing. Because they are relatively small, and very lightweight they are ideal for getting in to the remotest stretches of a lake, canal or any wetland, and they leave a minimal impact on the surrounding environment – working equally as well on the water as they do on land. These innovative machines were introduced in the mid 1990’s and with an extensive range of easy to fit tools they have become to waterway management what the Swiss Army knife is to the soldier! To discover more about the Truxor, visit our website, or take a look at our video channel on Youtube. For for a closer look at the Truxor, why not visit us at the CLA Game Fair at Blenheim Palace on 18th, 19th and 20th July on Stand No B184! We’ll be happy to provide an explanation of how the Truxor machines work and what benefits they have over other plant and machinery when it comes to working on any body of water. Alternatively, call us on: 01788 810614 or email: info@aquatic-solutions.co.uk.